Humans are glued to their phones during events, conferences and meetings etc. That’s not the problem (well maybe it is). 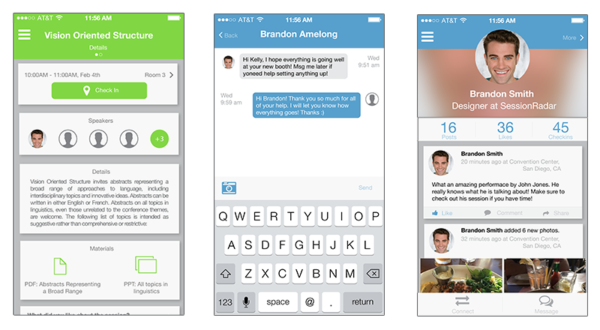 How do we get guests to use their phones to enhance their real life experience and engage directly with other guests? How do we make the check in process less miserable? 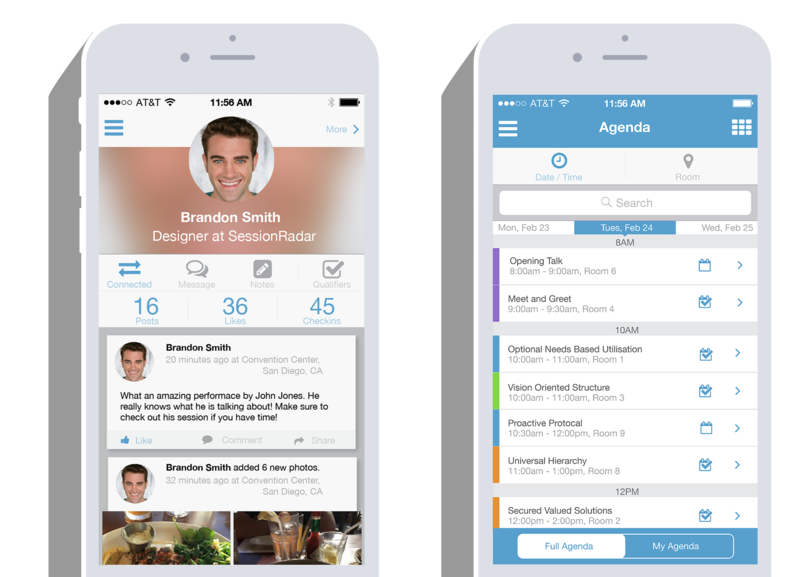 SessionBlue allows beacon technology to automatically check users into events, meetings and sessions while seamlessly allowing them to engage with guests, speakers and sponsors through an intranet. As of October 2014, according to the Pew Research Center, over 90% of Adult Americans own a cell phone with over 60% of them using it for things other than texting or making phone calls (2017 research now reveals 95%). 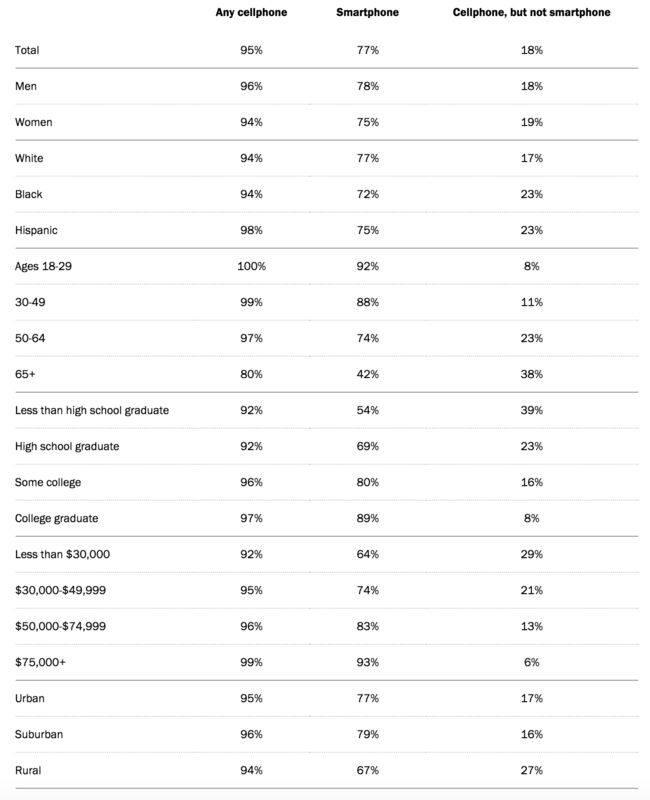 And these percentages are rapidly rising as technology progresses and new generations join adulthood. This app will focus mainly on iPhone and Android to engage with the guests. Source: Survey conducted Sept. 29-Nov. 6, 2016. SessionBlue will be a tool that uses an intranet to connect users via mobile app to engage in event sessions, leaderboards, speakers and surveys as well as beacon technology to track attendance. Based on the research found in the discovery period of the project a persona was developed, Julie Weathers. Designing for Julie helped in making informed design decisions as I had the end user always in mind. Julie Weathers is a working woman in her late 30’s. She is married but has no children. Her job is very demanding as she is constantly on the move, following up with clients and leads, and managing a team of sales reps. Her company sends her to conferences and events to network and stay on top of current trends. With everything that she has going on, it’s hard to stay organized and it’s easy to loose contacts and remember everyone she meets. 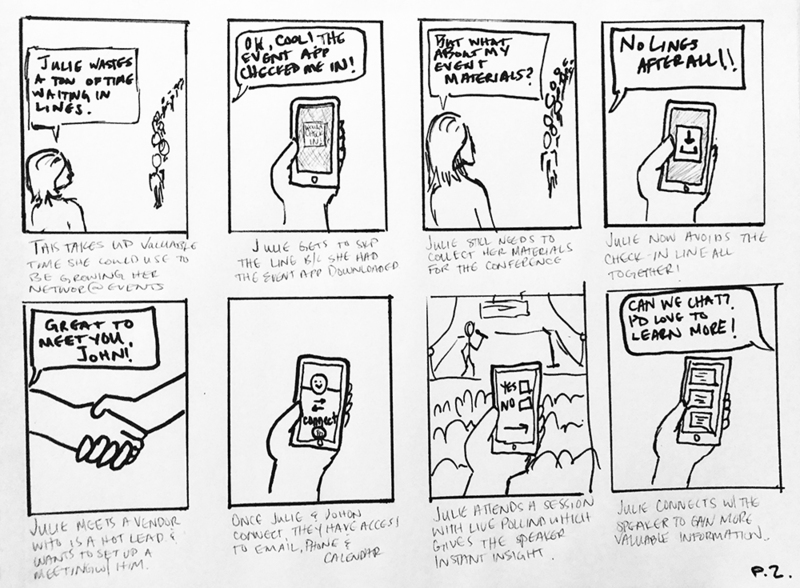 Keeping Julie in mind, I storyboarded the user’s behavior from the time they get within 25 feet of an event, to the time they leave the even three days later. These flows helped me define the necessary features for Julie to navigate through her app intuitively. By narrowing down all necessary features, I then proceeded to create a sitemap to organize the screens, info and navigation of the mobile app. Here you will see a progression of just a few of the key screens from lo-fi to hi-fi wireframes including annotations. 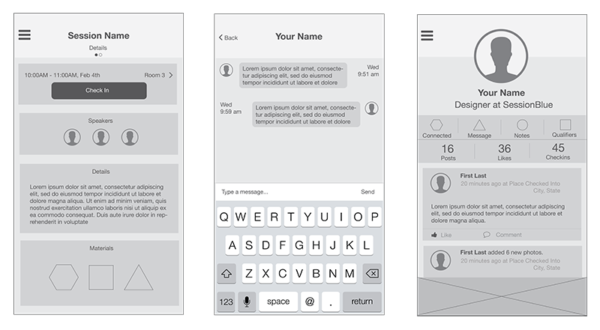 These iterations were based on feedback from user testing the lo-fi wireframes. With a hi-fi wireframe that was created based on feedback through the testing of the lo-fi wireframes, a prototype was created to gain more valuable and accurate feedback. Task 1: Walk within 25 meters of a beacon and checkin to your first session. Task 3: Complete the auto generated survey and them us know what you gained from your session and how they could improve. Task 4: Search for the speaker and connect with them via the mobile app as well as on LinkedIn.